Leading Manufacturer of axial fans and hermatic axial fans from Nagpur. The axial-flow fans have blades that force air to move parallel to the shaft about which the blades rotate. Axial fans blow air along the axis of the fan, linearly, hence their name. This type of fan is used in a wide variety of applications, ranging from small cooling fans for electronics to the giant fans used in wind tunnels. We are leading suppliers of this product. 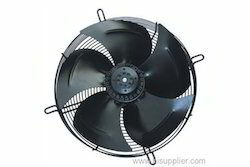 Looking for Axial Fans ?